Keeping in line with my recent tips on how to optimize Kontakt, here’s a great way of conserving memory. This is something that could prove to be invaluable for composers in particular due to the nature of the instruments they’ll typically be hosting in their templates. Large multi-sampled orchestral libraries can potentially use large amounts of RAM. Keeping that memory footprint as small as possible is important for obvious reasons. Utilizing the purge function can free up RAM by unloading any unused samples. Some libraries allow you to do this from within the library UI whereby you’re able to deselect certain articulations or disable certain mic positions. This can be seen in Spitfire Audio’s Albion One Library below. 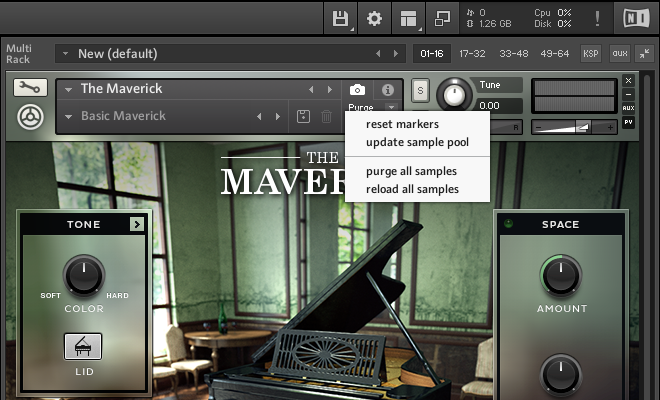 Reset Markers – When a sample is played it marks it as being used by Kontakt. This function removes the markers but doesn’t purge anything so keeps the samples loaded. There’s a few ways you can go about implementing the integrated purge function. 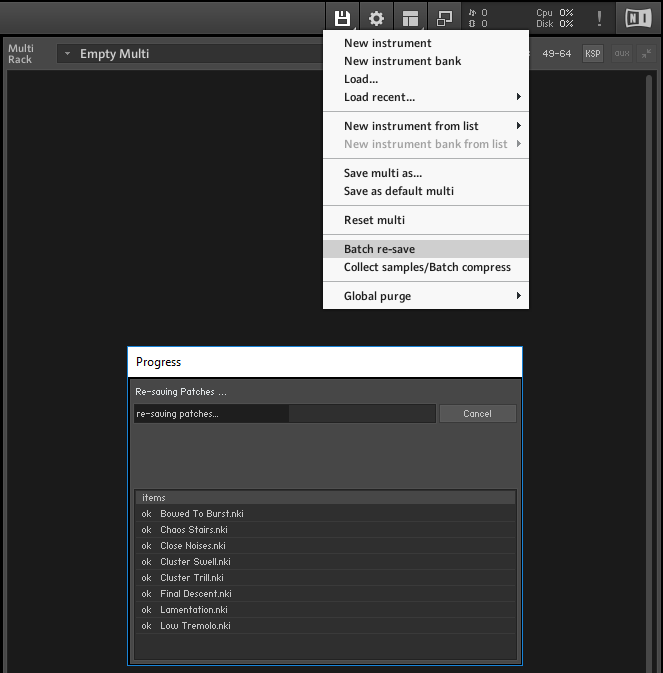 You could start with all samples within an instrument loaded (like it loads up by default). Once you’ve successfully laid down your part you could then simply reset the markers, run through the part from start to finish, then update the sample pool. This will unload any unused samples. Alternatively, you could start with all samples purged within an instrument. Then as you input your MIDI it’ll load the used samples in on the fly. It’s important to bear in mind if you decide to use this method and you’re using hard disk drives to host your samples, you may experience a few clicks/pops/missing notes on the first run through as the samples load from the disk. I’d certainly recommend using SSDs if you use this method. Notice the yellow indicator below after purging the Armageddon Ensemble patch (form Heavyocity’s Damage library), then playing a few notes. Also note the amount of RAM used! DFD (Direct From Disk) settings should also be considered here. When using DFD, only the first part of the sample is loaded into the RAM. The DFD buffer setting determines how much of the sample is pre-loaded into the memory. Lower settings load less of the sample into the memory so will decrease your memory footprint. As more of the sample is being loaded directly from the disk it goes without saying that SSDs will perform better than mechanical disks. Working with a large template and having every sample in every patch loaded may not be the most efficient way of working. Using this method, you could theoretically build a template consisting of many patches, each with the samples unloaded whilst keeping your memory footprint relatively small. You’d just simply load in the samples as and when you need them. Native Instruments Kontakt is one of my most commonly used tools in the studio so it’s massively important to ensure it’s performing as efficiently as possible. 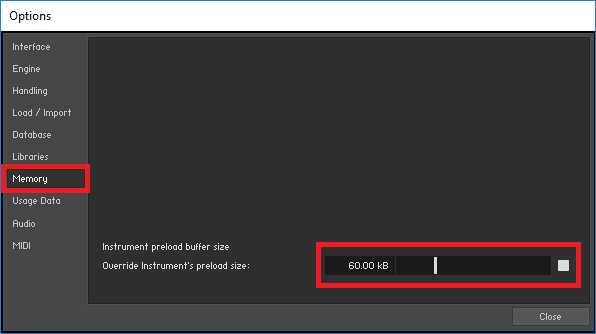 I’ve previously touched on how to enhance workflow with the Quick-Load feature but there’s another little tip to optimize instrument load-up times regardless of whether you’re using a beast of computer or whether you’re running a rig with limited resources. This is something that can be particularly beneficial for composers who will more than likely be using large templates where hosting multiple orchestral libraries is the norm. 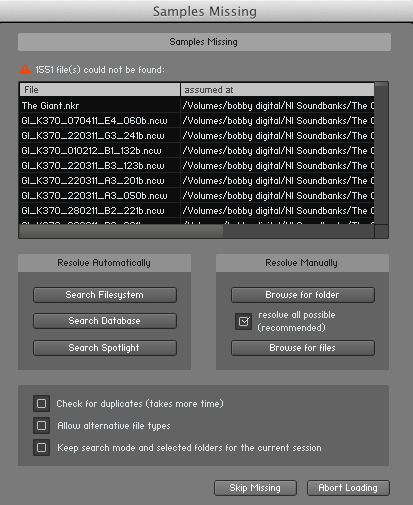 Anyone who has ever used Kontakt will undoubtedly have encountered the “Missing Samples” error. It’s easily enough resolved by selecting the location where the samples for library in question reside. It’s a case of then saving the patch so that the file paths are preserved. The Batch Re-save function goes one step further and allows you to correct the file paths for an entire library but it can also drastically improve load-up times especially for larger, more ram-intensive libraries and almost certainly if your sample libraries are hosted on mechanical drives. This process will effectively re-assign the samples to each patch within the library accordingly based on your own system’s storage configuration. To do this simply select the “File” menu and hit “Batch re-save”. You’ll be presented with a warning message. As long as you then select the original folder where the library is located (typically one level above the “Samples” folder) this is nothing to worry about. The reason for this warning being if any 2 instruments utilize the same naming structure for their samples, this process could potentially assign the wrong sample to the wrong instrument. Then just sit back and watch as all the file paths are checked are re-assigned. Depending on the size of the library, this can sometimes take a while but it’s well worth it in the long run. Batch re-saving is now the first thing I do whenever I install a new library. From personal experience I can honestly say this has greatly improved my instrument load-up times. Give it a try… See if it makes a difference!